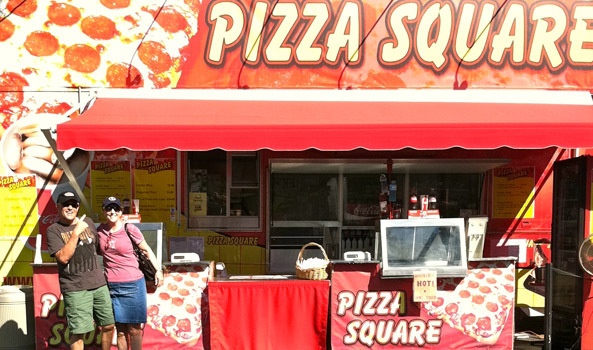 Not for the faint of heart the Pizza Square Trailer is BIG. Our service area is usually 40 feet long and 20 feet wide. The trailer with the tow truck is over 70 feet long. The trailer height clearance is 14 feet. The trailer may operate unplugged. The trailer can operate on its own – no need for electric or water hookups. It’s equipped with electric generators, propane for cooking, over 200 gallons of fresh water and a wastewater tank. Clean? You bet! The kitchen is all stainless steel with four sinks and hot water. For extra – big events, we also bring in a 14 – foot refrigerated truck to keep food fresh. 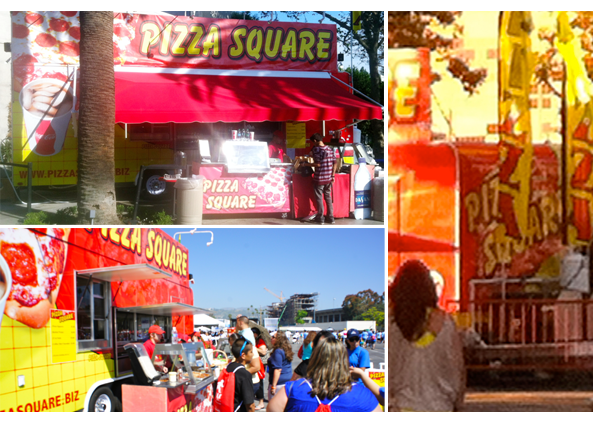 Pizza Square offers your organization an opportunity to fundraise and provide a needed service to the group you are serving. Freshly made pizzas from our refrigerated production area are placed into hot infrared conveyor ovens that send out perfectly cooked pizzas. We accept credit cards.